The last time you sat down to a Chinese meal in one of those grand and bustling Chinese restaurants in London’s Chinatown, did you by any chance think about who your waiter was, what had led him to Britain, or what his working conditions might be like? Have you ever wondered who separated and sorted those impeccable lettuce leaves in your designer bag of mixed fresh salad, or who picked and trimmed those perfect spring onions that you bought from a supposedly respectable high street supermarket? And what about that side salad you got from a world famous fast food outlet? What has made those pretty faces that appear in local newspapers offering massages and other services, of a more sexual nature, to British ‘gentlemen’, do this kind of work? These are the questions we don’t like to ask ourselves, we prefer to take it for granted that we can get these products and services at a cheap price. Hsiao-Hung Pai’s book, ‘Chinese Whispers’, reveals exactly how we get all the above and at what price. The stories of the people involved, which she masterly brings to light, make for uncomfortable reading. Hers is a tale designed to stir our consciousness and provoke anger and indignation. For ‘Chinese Whispers’ is a story of exploitation, shattered dreams and in many cases injury, or even death. Hsiao-Hung Pai goes undercover to investigate the hidden world of undocumented Chinese immigrants and in the process she exposes a reality unknown to most British people. She discovers a universe of fear, stress, racism, instability and above all loneliness and sacrifice. Many of these people have invested everything they and their families have to get to Britain with the dream of making a better life for their children and their loved ones. Unfortunately, as Pai divulges, their dreams and sacrifices are often in vain. Our salads and spring onions are the product of hours of underpaid and often unpaid work, carried out in diabolical conditions under the tyrannical supervision of the gang masters. The farms and factories where all of this takes place are hidden in the depths of the respectable middle-England countryside. So the next time you sit down to a Christmas turkey raised in Norfolk, think about the dreadful conditions of the workers who got it to your plate. Pai’s vivid description of a turkey factory conjures up memories of Upton Sinclair’s ‘The Jungle’ and may well have you switching to nut loaf next Christmas. No this isn’t India or China, but Britain 2008. How can this happen? Pai tells us how. Through a chain of murky subcontracting and sub- subcontracting, the big supermarkets, fast food restaurants and other major companies can benefit from this cheap source of easily exploitable and disposable labour, while at the same time denying all knowledge of wrongdoings and washing their hands of all responsibility. 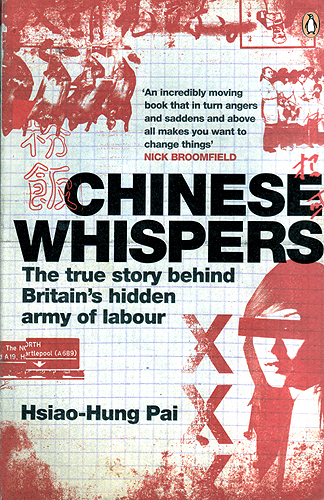 I recommend this book to see another side to Chinese immigration and immigration to Britain in general. Outside the headlines about ‘invasion’ and the end of ‘British Culture’ there are real people whose real lives are making Britain work. I signed up to your feed! Are you going to post more about this theme? Exactly what I needed to get. Really very clear and valuable post. I am without a doubt a violator of many of those guidelines.